When Mr. Li announced early today that he'd probably need five hours, rather than four, I thought, dear God, there just isn't enough coffee in the world to get me through that. Turns out I didn't need a single cup. Luis Li was producing enough adrenalin today for ten people. Twenty minutes in I wished someone had switched him to decaf. He was in rare form. This was not the dull, phoning it in Luis Li we saw in the opening argument. Nor was it the meandering, tangential, philosophical Li. This Luis Li was a fire-breathing defender of the US Constitution. Li took the podium in a swirl of angry intensity and immediately unleashed a tirade. Good morning ladies and gentlemen. I gotta tell ya. As I sat through this trial; as I sat through yesterday's argument; and as I sat through today's argument, I got pretty fired up. As the State repeatedly accused us, Mr. Kelly, myself, Ms. Do, of uh, misleading you, of feeding you baloney, of misrepresenting the facts during the trial, I had a reaction. And I wrote a lot of it down; page after page. Ms. Polk said that I misrepresented the record. Well that's not actually what happened. I wrote down what I thought. I got pages of this stuff. But you know what I realized? And you know what I know. Is it's not about me. It's not about me. It's not about Mr. Kelly. It's not about Ms. Do. It's not about what Ms. Polk thinks; she thinks the evidence shows. It's not about whether she thinks we're misrepresenting something, we're feeding you baloney. This is about you; each and every one of you. Beginning of this case, you'll probably remember this, I told you that our Constitution and our system is a promise that our founders made to all of us and that promise was that this would be a nation of laws and that those laws would do what? They would limit the government. He was off an running in a wide-ranging, libertarian rant. In disconnected, sidewards references, he threw out big chunks of red meat. He took on the nanny state that could take away your children, take you off your respirator, make you wear a motorcycle helmet, or dare to suggest that you don't have every right to bake yourself to death in a sweat lodge if you so choose. Credit where credit is due: It was brilliant. I have said from the beginning of this trial that the biggest hurdle for the State, and, thus, the strongest angle for the defense, is the free will argument. And Li has finally gotten it about right. He was lucid. He was comprehensible. He was like a different guy entirely. Of course he also took wild liberties with the facts, was grossly misleading, and could not resist at least a little of his trademark self indulgence. The man loves to tell stories about himself. To illustrate his point about the rights we as Americans have to take on high risk activities, he shared a little anecdote about his own mountain-climbing experience. He'd been warned about the discomfort of being at such high altitude; the cold, the nausea, the "walking on a knife's edge," the fear. He took on those risks willingly as a free man. We all have the right to take on such risks in this country and take responsibility for those risks by signing waivers, explained Li. I, for one, find it hard to believe that when Li went on his mountaineering adventure the waiver he signed was as perfunctory as the one JRI made participants sign for Spiritual Warrior. I find it hard to believe that he wasn't required to fill out a health questionnaire; likely with a doctor's signature. (Like my daughter had to provide to go to camp.) I have mentioned previously that my very active husband has signed many a waiver. The most complicated waiver and health history he's filled out to date was for Outward Bound. That, funnily enough, was for a mountaineering course. My husband points out that if someone in his party had gone down with hypoxia, everything would have come to a halt. Their team guides from Outward Bound would never in a million years have said anything like, "Leave him. Let him have his own experience. We'll pick him up on the way down. We gotta keep movin.'" As it happens, the second night of my husband's course, one member of his group went missing. She'd gone off to relieve herself in the woods and had taken a wrong turn. And everything stopped. Every member of the group went to search for her. It was understood that had she not been found, search and rescue would have been called in and their mountaineering experience would have been postponed or canceled. I should be clear about this point so there's no confusion. While Outward Bound is primarily for teens, this was a program they offered for adults. It was actually only available to combat veterans who had served in Afghanistan or Iraq. So these were also "grown-ups" choosing to take risks of their own free will. No responsible organization has people sign a waiver and then says, well, you're on your own if you get hurt. They have precautions in place proportionate to the risks involved. For instance, one of the two Outward Bound guides who led my husband's mountaineering trip was a certified Wilderness EMT. A couple of weeks ago I noticed on the news that a lot of people had gotten sick at a marathon in DC. We were in the midst of a heat wave and there were numerous cases of heat related illness. You know what else I noticed? That marathon planners had medical personnel in place and those who got sick were treated immediately. Marathons routinely have health stations along the route to treat the kinds of illness and injury that typically occur in marathons. This is the central problem with Li's argument. You can't, on the one hand, say James Ray was running a high risk activity for people who willingly chose to push themselves to the limit and, on the other hand, scoff at any suggestion that he had a responsibility to have medical assistance available in case of injuries. Injuries are inevitable in high risk activities. To not be prepared for that is inconceivably reckless. Let's face it. If James Ray had been running that mountaineering class, he would probably have told them all to jump off a cliff so they could turn into birds and fly like Castaneda's fictitious shaman don Juan. You can almost hear him saying, "You're all shamans now," as they crash to the ground. But he would have had them sign waivers first. They definitely would have signed the waivers. In another nod to the Constitution, Li, if somewhat obliquely, addressed Ray's freedom of religion. This was something that was discussed at length yesterday in legal arguments. The defense is very concerned that Ray's unorthodox beliefs might cause prejudice. This is not an argument I'm unsympathetic to. I, for one, have been appalled at the way the defense has mocked the spiritual beliefs of the Hamiltons and Fawn Foster. I also hold unorthodox religious beliefs and I am a firm believer in the Jeffersonian wall. Even so, I thought the arguments made by Tom Kelly and Luis Li were a stretch. According to Kelly, for instance, the fact that Ray believes a vegetarian diet can cause ungroundedness constitutes a spiritual belief and should not be trotted out in front of the jury. Judge Darrow clarified that he allowed much of this material in as context. The context in this case would be, I think, that Ray provided a vegetarian only diet in an attempt to deliberately throw people off balance. Luis Li was disturbed that Ray's "prayer" about being the Alpha and the Omega was testified to by the State's witnesses. Ray's allusion to the book of Revelation pertains to his religious views and should be out of bounds, according to Li. Today in is his closing argument, he addressed Ray's statement and pointed out to the jury that some people quote the Bible when they "say prayers." That's just something "folks do." The point is, said Li, that not a single person there thought Ray was God. What I thought was funny about this was that Li truncated the quote, leaving out the last phrase. What Ray actually said was, "I am the Alpha and the Omega. I am God." So perhaps one person there did think Ray was God. Ray. This actually raises an interesting question. Is a god complex a Constitutionally protected religious belief? I honestly don't have an answer for that but it's something to contemplate. The stickiest part of Li's Constitutional rant came at the beginning of his remarks. His outrage at governmental overreach was aimed very directly at State prosecutors. Sheila Polk didn't just insult Luis Li and hurt his feelings. He's over that. His anger is at the position the State had put the defense team into. 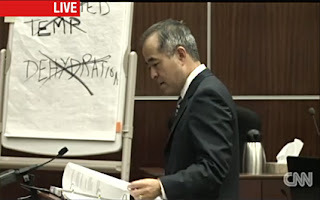 Li took his "burden shifting" argument directly to the jury. That's why the judge yesterday, and this morning, had to instruct you, again, as to what the burdens of proof are. Again. And it's not the first time. In fact, the judge had to instruct you as the judge has instructed you before in the middle of a cross exa, uh, uh, examination of Det. Diskin where they were asking questions about, why didn't you know about the organophosphates?... And you the court had to give that instruction again this morning. Why is that? Why is that? I was a little stunned at this argument. It didn't seem appropriate to me. It didn't seem appropriate to Judge Darrow either, as it happens. It was hashed out in very heated legal arguments in which Ms. Polk argued that Li had improperly arrogated to the defense's argument "the weight of the court." Li, for his part, was insistent that the State had improperly shifted the burden, was in violation of the Constitution, and that the defense had every right put that issue in front of the jury. Judge Darrow clarified that he had agreed to the limiting instruction as a remedy for comments by Ms. Polk that got right up to the line and may have crossed it but that he did not see a Constitutional violation. He reminded Li that he had denied his mistrial motion. The statements Li found to be "burden shifting" and a Constitutional violation were simply this: In having to address the Willits instruction, Polk found it necessary to explain that they did not learn of the issue of organophosphates until right before the trial from the defense. To Li, this means the State is implying that it was the defendant's responsibility to provide them with that information. Polk feels that she was simply pointing out the sequence of events and explaining why it hadn't occurred to the State to test for organophospates until the defense brought the issue to the State's attention. Judge Darrow felt it got close enough to the line that it required a limiting instruction. The upshot? Judge Darrow had to deliver another limiting instruction to address Li's improper usurpation of the court's authority. Sadly, I did not hear it and cannot provide the text as CNN, once again, failed to start the stream after a number of breaks and also, repeatedly, forgot to turn the sound on. So, once again, I missed chunks of the proceedings. I only know the instruction was in fact read because of a mention in this article. The prosecution and the defense accused each other of misstating the facts and the law in their contentious closing arguments, causing Yavapai Superior Court Judge Warren Darrow twice Thursday to issue special instructions to the jury to correct what he considered improper statements by each side. "There is something profoundly wrong with this case," he said, referring to the defense's repeated accusations that Polk has pushed the boundaries of legal ethics throughout the proceedings. "That's why the judge had to instruct you again what the burdens of proof are." As has been the trial's pattern, Li's comment drew a fierce objection from Polk and resulted in yet another jury instruction from Judge Warren Darrow, who told the jurors that his instructions did not indicate that he favored either side or either argument. But while we're on the subject of what the State knew and when about organophosphates, I continue to be amazed at the way the bit of background noise referring this mysterious poison has taken on a life of its own. Li played it yet again for the jury. Again, this is a completely unverified piece of evidence. The speaker has never been identified and cannot be cross examined. His words have been used by the defense to demonstrate the possibility of organophosphate poisoning, to undermine medical testimony of actual doctors and Medical Examiners, and convince them in court that they had not received important information on which to base their conclusions. And today it was used in open court to demonstrate that the State was negligent and ignored key evidence in their possession. For the love of God, it was background noise. Something occurred to me today, though, as I listened to Li's pontification on the importance of the unidentified EMT and his insistence that had the State simply listened to that recording, they could have given that information to the hospital and gotten the necessary bloodwork done. What occurred to me was this: Why didn't the "EMT" pass that vital concern along to the hospital. Wouldn't that be part of his job? And if organophosphate poisoning was such an obvious concern, why didn't more EMTs and paramedics note the symptoms and pass that along to the hospitals when they brought these patients in? Why wasn't it in their reports? For that matter, why weren't the symptoms apparent to the doctors if they occurred to that person who may or may not have been an EMT? As discussed, the symptoms of cholinergic poisoning were noted and ultimately dismissed because it was such a mixed bag and there were more symptoms of anti-cholinergics than cholinergics. As testament to that, Li mentioned something today that just struck me funny. He referenced a note on Stephen Ray's medical chart about a possible "anti-cholinergic toxidrome." "What does that tell you?" Li asked the jury. I know what it tells me. It tells me that Ray's doctor was not seeing symptoms of organophosphates. 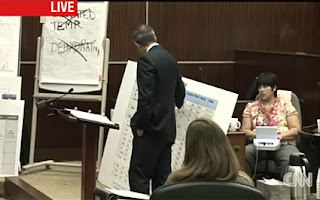 Li's discussion of the medical testimony was all about that wrong-headed and confusing. Mostly he extolled the virtues of Dr. Paul and berated the worthiness of Dr. Dickson's testimony. After a while, I thought a caged death match between the two doctors would have been more instructive and illuminating than Li's version of facts. Instead, we'll have another two hours of Li tomorrow. Sheila Polk completed her closing argument today. I found it extremely powerful. As she had done in her Rule 20 argument, she wove the statements of various witnesses into a clear narrative of the events leading up to the deaths of James Shore, Kirby Brown, and Liz Neuman. It was extremely moving and I don't think there's a way to do it justice. Twinkiewrangler has posted a transcript of her entire closing argument here, so you can read her words. I do hope, though, that someone will post video of her remarks because they really need to heard aloud to be fully appreciated. I look forward also to hearing her final rebuttal and I assume that after that this will go to the jury sometime tomorrow. Update: Ah. Here we go. The Salty Droid has created a video of highlights from both days of Sheila Polk's two and a half hour closing argument. All information on the trial today comes courtesy CNN's live feed. They not only returned unexpectedly for closing arguments but added exciting, new camera angles. All quotes and paraphrased statements that are not linked to a source document are my best attempt to transcribe material from live broadcasts. I love your blog on this trial and your perspectives. All of your articles are quite brilliant and humorous. While it will be a blessing that this trial is almost over for the family's of those who have died and were injured, I will surely miss reading your blog.